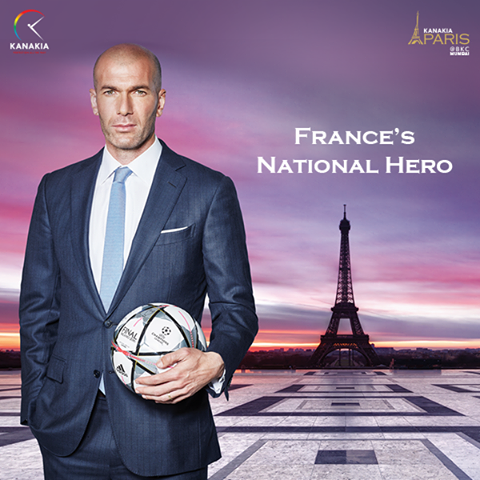 France's national Hero, Zidane skillfully built his football career with his focused vision & great leadership skills. Zinedine Zidane, a three-time FIFA World Player of the Year led France to victory in the 1998 World Cup. He starred for clubs in France, Italy and Spain, against all odds , through his sheer talent, passion and hard work, is an idol for all of us who strive to achieve excellence through out life. He is regarded as one of soccer's all-time greats. So I salute Zidane with ... " Zidane Zindabad "
Being born with a gold spoon in mouth and then dazzle in the social arena is too common to even notice, on the other hand Zinedine Zidane was born on 23 June 1972 in La Castellane, Marseille in France. His parents, Smaïl and Malika, emigrated to Paris from the village of Aguemoune in northern Algeria in 1953 before the start of the war . The family, which had settled in the city's tough northern districts of Barbes and Saint-Denis moved to the northern Marseille suburb of La Castellane, Marseille. Zidane was born as the youngest of five siblings. His father worked as a warehouseman and nightwatchman at a department store, while his mother was a homemaker. The family lived in the area, which was notorious throughout Marseille for its high crime and unemployment. Zidane true to his name ( Zidane means growth , progress ) reached the summit in soccer field within a short span of time, through an elegant game , which was praised by his fans as well as his contemporary players all over the world. Brazilian soccer star Ronaldinho stated, "Zidane is one of the best footballers of all time, one of my idols. He had such elegance and grace, a wonderful touch and superb vision." So I cheer for him , vigorously "Zidane Zindabad "
Aamchi Mumbai is all zestful to welcome Zinedine Zidane on June 10th at #KanakiaParis . Zidane, the son of Algerian immigrants, learned to play soccer in the streets of La Castellane, a rough n tough section of Marseille. After starring for local youth clubs, 14-year-old Zidane was discovered at a French Football Federation training camp by AS Cannes recruiter Jean Varraud, and practiced the next three years honing his skills in Cannes' youth division. Early start, Starting young has many advantages for a blooming career. Soccer-master Zidane made his first professional appearance for Cannes at 17, scoring a goal in his debut. He transferred to Bordeaux in 1992, and in coming years the attacking midfielder earned reputation for his spectacular all-around play. Prone to the occasional flash of temper, Zidane otherwise was the embodiment of control with the ball at his feet, seemingly knowing when to maneuver through the defense, find a teammate with a pinpoint pass or rocket a shot at the goal. Zidane was selected as the best European soccer player of the past 50 years by the UEFA Golden Jubilee Poll in 2004 and was included in the FIFA 100, Pelé's list of the 125 greatest living players. Till today he remains one of the select greats to win the FIFA World Player of the Year / Ballon d'Or award three times. I love Zidane. He is lightening fast on field, his passes and finishes, just amazing. And his penalty shot, GOD! He is a genius. Nice post and really appreciate your effort #BlogforZidane. Hi Gowthama , Welcome to 'Spirit Of Mumbai'. Thanks for appreciation. This is my first post about Sports and I am glad it's crowned with Zidane. Zidane headbutt was very costly. i watched that match live, and also read about his side. But still its a final and a costly mistake. What has Sanskars got to do with football match? You play the game because you love it. Have u lost it totally?. You , yourselves started with "Headbutt", which is not a football term in any context. you just google "Headbutt" and find it yourself, u will have Zidane in images section. You seem to be infatuated with it. You may do R&D about it and can submit your thesis. All the best for your PHD in 'Headbutt'.